When it comes to farm robots, fruit gets all the attention. But it looks like trees and shrubs could win the prize for first significant agricultural market for small mobile robots. Massachusetts startup Harvest Automation is beta testing a small mobile robot that it’s pitching to nurseries as the solution to their most pressing problem: a volatile labor market. The multi-billion-dollar industry that supplies ornamental plants to building contractors, big-box retailers and landscaping firms — $11.7 billion according to the most recent USDA figures — has been eagerly awaiting automation for decades. The down economy and harsh state laws targeting undocumented workers have turned up the pressure. The horticulture industry has caught the attention of several robotics industry veterans, including Joe Jones, a co-inventor of iRobot’s Roomba vacuum cleaning robot. What they see is an opportunity to develop a small, relatively inexpensive, mobile material handling robot. Their venture-backed company has been field testing the robots at 11 nurseries around the country, and plans to release its first product at the end of the first quarter or beginning of the second quarter next year. Harvest Automation bootstrapped the development of prototype robots and received its seed funding from its customers, said CEO Charles Grinnell. The company landed $5 million in venture capital funding from Life Sciences Partners, the Midpoint Food & Ag Fund, and the Massachusetts Technology Development Corporation. In today’s human-tended nurseries, immature potted trees and shrubs arrive at nurseries by truck and are offloaded onto the ground. Teams of migrant workers — undocumented for the most part — spread the plants out one by one following markers outlining a grid. When the plants are ready to be shipped out later in the season, workers reverse the process to group the plants for loading onto trucks. “We’ve recognized the need for robotics in the nursery industry for moving pots because it’s one of our highest concentrations of labor use,” said Tom Demaline, president of Willoway Nurseries, Inc. in Avon, Ohio. Small mobile robots that tend crops are just emerging, and most of the action is in produce. Row crops provide a semi-structured environment, and several companies are marketing four-wheeled robots with computer vision systems that monitor and in some cases tend to crops. The most advanced are medium-sized strawberry-picking robots, notably a machine from Spanish firm AgroBot. One player in the nursery automation market is British firm CMW Horticulture Ltd., which sells a medium-sized pesticide-spraying robot for greenhouses and nurseries. The Harvest Automation robots are knee-high, wheeled machines. Each robot has a gripper for grasping pots, a deck for carrying pots, and an array of sensors to keep track of where it is and what’s around it. 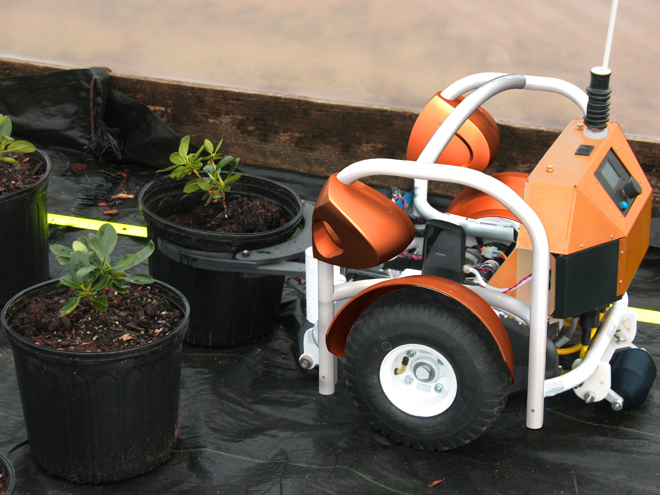 Teams of robots zip around nursery fields, single-mindedly spacing and grouping plants. Think Wall-E without the doe eyes and cuddly personality, or the little forest-tending ‘bots in the 1972 sci-fi classic Silent Running. Key to making the robots flexible and cost-effective is designing them to work only with information provided by their sensors. They don’t construct a global map of their environment, and they don’t use GPS. The robots have sensors that detect boundary markers, a laser range finder to detect objects in front of them, and a gyroscope for navigating by dead reckoning. The robots determine how far they’ve traveled by keeping track of wheel rotations. The robots are also designed to be easy to use. A human worker orients a robot toward a group of potted plants and uses a small touchscreen to select from a set of graphical task representations, which indicate the pattern and distance for spacing the plants. The worker hits a button to specify that the robot look for a boundary marker to the right or to the left. This simplicity is key to keeping the robots affordable. Harvest Automation hasn’t set a price yet, but is targeting the $25,000 to $50,000 range per unit. The robots are “much more efficient than the human workers, so we’re going to save [nurseries] money just on the unit cost to move a plant,” said Grinnell. Nurseries cram most of their activities into 120 days of the year because the growing season is also the shipping season, said Ollinger. “Everything in agriculture is about time,” he said. “We run out of hours in the day.” With robots spacing and planting next year’s crop, human workers could focus on picking, processing, packaging and loading this year’s plants, he said. Further down the road, Harvest Automation’s robot could also find work in warehousing, construction, mining and manufacturing, said Grinnell. The robot could be adapted to handle different materials, and its size, cost and compatibility with human workers could open up a lot of possibilities, he said. In the meantime, don’t be surprised if the next time you drive by a nursery the shrubs appear to be moving by themselves. It’s just the march of progress.